Create a Ubuntu Rescue Remix Live USB Flash Drive from Windows: The following tutorial covers one method of installing and running (URR) Ubuntu Rescue Remix 9.10 or 10.04 to a USB Flash Drive using a Windows PC and our Universal USB Installer to perform the install. 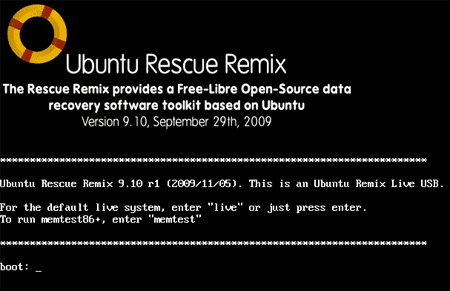 Upon completion, Ubuntu Rescue Remix can be run from a USB Flash Drive. Created and maintained by Andrew Zajac, URR is a Linux system providing data recovery specialists with a command-line interface, equipped with the best free-libre, open source data recovery and forensics tools available. Note that this installation process can utilize a casper-rw loopback image file for persistently saving and restoring changes on subsequent boots.